If you want to talk about throwing football parties on a budget, I’m your girl. Throwing parties can get so expensive, which is why I wanted to share my tips for throwing a football party on a budget. It is possible to keep money in your wallet and feed all your guests. You just need to know all the right tips. 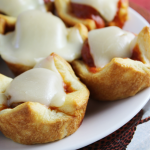 One way to throw a football party on a budget is to make everything yourself. It is amazing how much it can add up when you are paying for the convenience of delivery. Skip the delivery and focus on making everything you can yourself. Trust me, this will save you a ton of money in the long run. I’m a control freak. In the past, whenever someone offered to bring something, I would say “no thanks, I’ve got it covered”. 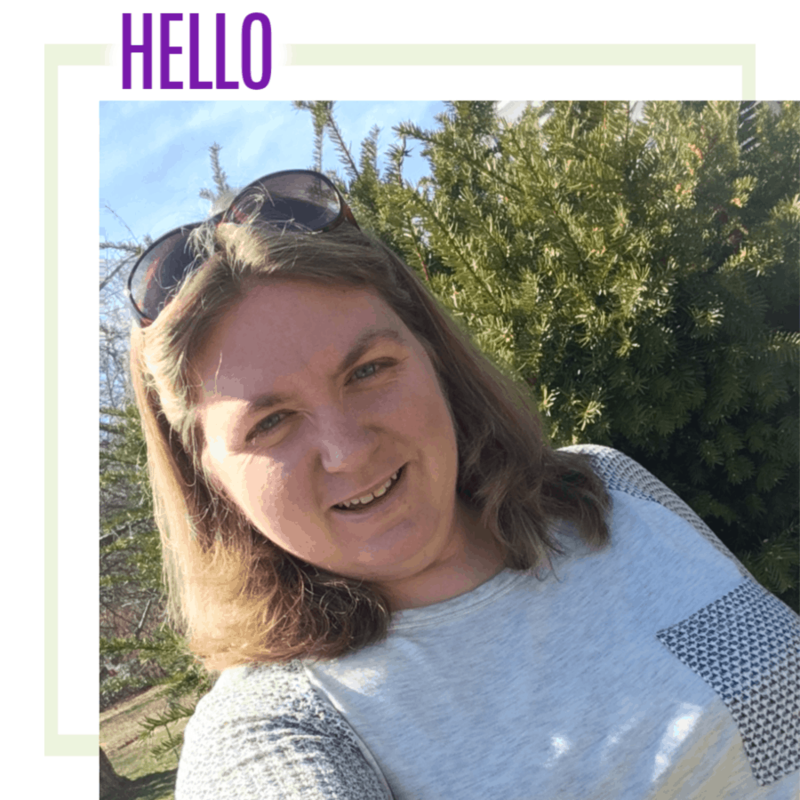 This year, I plan on giving up some of that control and letting guests help! No one ever minds grabbing a bag of chips, bottle of soda, ice, some cookies, or paper products. Let them help and it keeps money in your wallet! Just because you are throwing a football party, it doesn’t mean you should spend a ton of money. In my experience, keeping things simple really can help you keep things on budget. Skip serving a whole meal and only serve appetizers. Serve water instead of soda. Throwing a football party on a budget means you need to try to stay under your budget. I like to see how much money I have to spend on the football party. The best way for me to stay under budget is to head to Save-A-Lot. Find your local store: https://goo.gl/xuQiow. Their everyday low prices are amazing at up to 40% less! Look for a coupon in your local ad (*at participating stores). Not only does Save-A-Lot have food, but all the paper products you need for throwing a party on a budget! I picked up everything I need for a gigantic pot of chili for under $20 (prices may vary by location). Remember earlier when I said skip delivery, well, also skip the pre-cut-up foods. Do you know how much you get charged for the convenience of pre-cut-up foods? Cut up veggies and fruits yourself and you will save a ton of money. I understand it is time consuming, but that is why it is wise to manage your time well when you are planning a football party on a budget! Just because you’re on a budget, it doesn’t mean you are destined to a boring party. You can really have fun with a party, just by being creative. When I decorate for parties, I always try and use what I have. 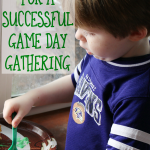 Pinterest is a great resource for making your own football party décor. Grab our free printable football popcorn boxes and fill them with fun snacks for the game! Make something that can be used in a few ways. Taco meat and chili are both great for this. You can serve them over chips for some nachos, over fries, in bowls, on top of salad, in little individual cups. I think this helps get you the most bang for your buck. Just sit out your slow cooker full of the main dish and then set out your chips, cheese, lettuce, tortillas, fries, sour cream, and any other toppings you can think of. It will be like you’re serving more food! 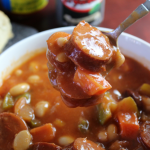 Add everything to slow cooker and stir. 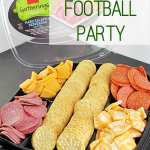 Thanks to Save-A-Lot, you can throw your own football party on a budget! For a chance to win a $25 Save-A-Lot gift card, enter the giveaway below! Do you plan on throwing a football party this year? What tips do you have for someone on a budget? If I am having a lot of people over, I will buy in bulk at a store like Costco. I save money buying items on sale and using coupons. 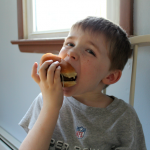 We save money on football parties by planning our menu in advance and buying stuff on sale and with coupons. We also usually will provide a big main dish like pulled pork or tacos that can be pretty cheap and then ask people to bring some sides that way we aren’t paying for everything and we get to try a bunch of different things! I save a few different ways. We hold a pot lucks, I use coupons and shop sales to stock up. I agree about double duty foods. I love taco bars for this reason too! I’m so looking forward to this year’s superbowl party! I have everyone that’s coming bring something , from food to paper plates.